The Tongariro Alpine Crossing is stunning all year round, and undertaking a hike of almost 20kms over an active volcano, is testing for most people. Attempting the Tongariro Alpine Crossing in winter brings with it a new set of challenges. With the change in weather, the experience is very different, requiring more preparation, equipment, and even a guide. If you are thinking of doing the crossing in the winter months, have a read of this short article we’ve put together, which gives you a better idea of what to expect, what you’ll need, and how to prepare for it. The start of the Tongariro Alpine Crossing begins at the Mangatepopo car park, where groups are dropped off. The first 30 minutes of the track is relatively flat, but will gradually start to rise as you head to the check point, Soda Springs. Here you will find toilet amenities if you need them. The next stage of the trek is a little bit tougher, with a steep climb called “The devil’s staircase”. You should take your time with this climb, giving yourself up to 60 minutes, and when you get to the top, the panoramic views are worth every step, especially in winter. From there you head towards the highest point on the crossing, the Red Crater. During the winter months, this is usually considered the point at where your guide will decide if everyone can continue. Weather conditions can be treacherous, with snow and ice often making the trek too dangerous from this point on, but every day is different, and your guide will make the call with everyone’s safety in mind. If it is safe to continue, then it’s all downhill from this point. The next stage of the crossing is the walk from the Red Crater to the Blue Lake. Absolutely stunning in summer, the natural beauty of this area is taken to another level in winter. Surrounded by snow, the Emerald Lakes are three craters which have filled with water over the centuries, with their stunning green/blue colour coming from minerals which have leached from the surrounding volcanic rocks. In the summer, a walk around the lip of the crater is next, but this is too dangerous in winter. Instead, an alternative route is taken, cutting out the Blue Lake and rejoining the track at a safer spot. Don’t worry, you’re not missing much – the Blue Lake is usually covered in snow, so you can’t see it! This marks the beginning of the descent as you zigzag your way down to the Ketetahi Hut where the end of the Tongariro Crossing is in your sights. As you descend, the snow makes way to fauna and flora, ending your Alpine Crossing experience with flowers and birdsong! The Tongariro Crossing in winter is cold, wet and windy. Even on a nice, sunny day, the weather is notoriously unpredictable and can turn very quickly. Your guide will make a decision on whether to attempt the crossing on the day, using the MetService weather forecast. If things take a turn for the worst while you are on the Crossing, your guide may decide to turn back. Remember, safety is paramount, and you should always listen to experience. You also need to realise, a guide is simply that – a guide. They are not your boss and not your babysitter. You are doing this crossing, so you need to look after yourself. You are the one responsible for your experience, meaning you need to take the necessary precautions for an 8-hour hike over a mountain range in snow and ice. There is no clean drinking water available along the route, so bring at least 2 litres of water with you. And if there’s no clean drinking water, you’re certainly not going to find a McDonalds, so bring food, preferably the high-energy variety. Warm clothing is a must during summer, so winter means you’ll need specialised clothes. You’ll need at least three layers of clothing, with thermals underneath to keep you warm. Wind and waterproof jackets and trousers are recommended, along with a hat and gloves. A good pair of hiking boots are essential. Footwear must come to above the ankle and be made of a non-mesh material, i.e. leather or Gore-Tex. 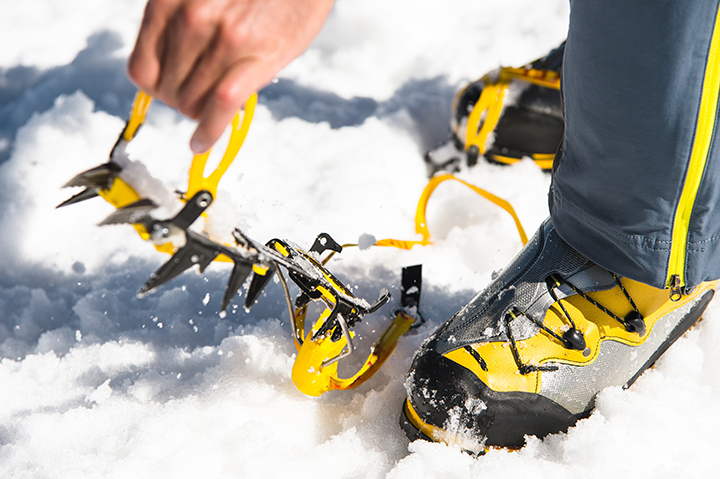 Crampons will usually be supplied by your tour guide, along with a cool ice-axe for those tricky parts of the crossing. Although it’s winter, a sunny day can result in serious sunburn, so always bring sunscreen and lip balm. A good pair of sunglasses will help with the glare, especially if there’s snow on the ground, and of course, bring your camera to capture some of New Zealand’s most stunning landscape. The Tongariro Alpine Crossing isn’t exactly mountain climbing, but it’s not a walk in the park either. Whether attempting the crossing in winter or summer, with or without a guide, you’ll need a decent level of fitness and be in good health. Medical conditions such as high/low blood pressure, heart conditions, epilepsy and chronic asthma may prevent you from doing the crossing. Each should be taken on a case-by-case basis, and your guide will ask you to sign a form stating you are fit enough to make the trek. The trek takes off around 8:30am, and finishes at 4:30pm. That’s a full day’s walking with breaks in between. The walking pace is around 3km/per hour, which is achievable for pretty much everyone, unless exercise is completely alien to you. The Tongariro Alpine Crossing is iconic, walked by as many as 100,000 people each year. Because of this, it can be easy to forget that it is a serious trek over mountainous terrain, made even harder by ice and snow during the winter months. The extra difficulty in winter is totally worth it to view the the magnificent landscape blanketed in snow, especially the three peaks of Mt Ngauruhoe, Tongariro and Ruapehu. We can help you make the crossing in winter by organising your trek through Adrift Guided Outdoor Activities. Through the experts at Adrift, you will be provided all the necessary gear and equipment, plus all the attention you need to stay safe, warm and happy during the crossing. 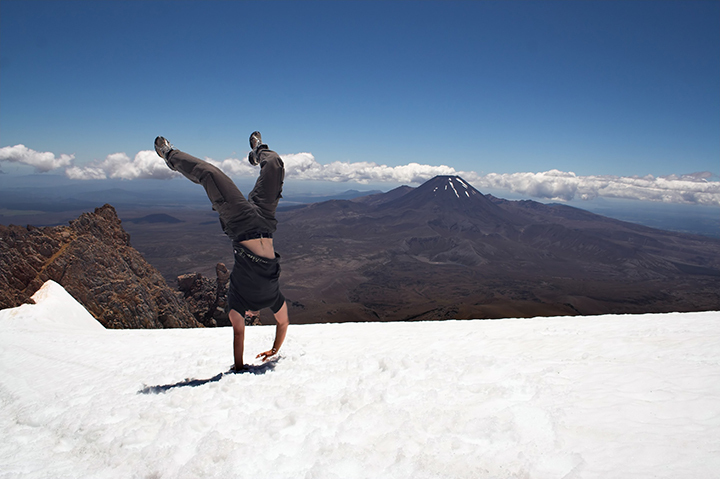 Make your Tongariro Alpine Crossing one to remember by experiencing it during the winter months. Bringing with it new challenges, sensations, and skills, the crossing during winter is one of the most spectacular experiences New Zealand has to offer. 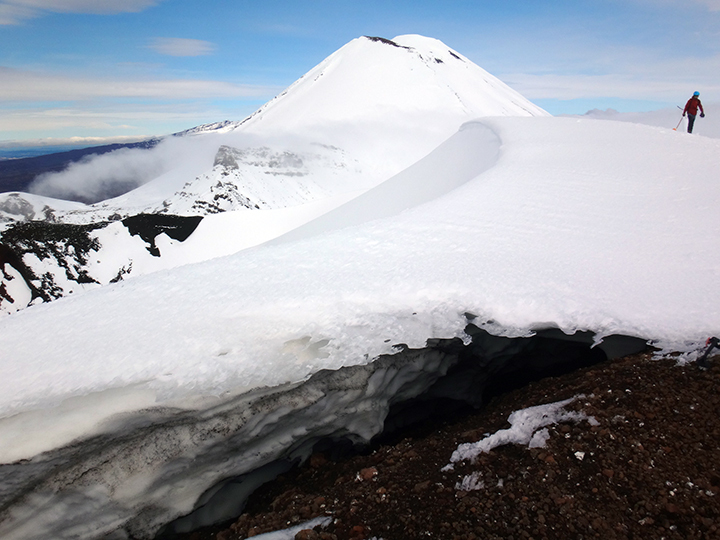 Contact us today if you would like to tackle the Tongariro Crossing in Winter.